We are now taking orders for the new BlackBerry model which is being released today. 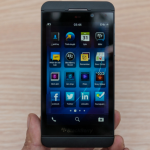 This is the first BlackBerry device being released this year, and the first BlackBerry device to feature BlackBerry’s new operating system BB10. To make sure you don’t miss out, order with us today!